☞ DATE & TIME: Saturday, March 23 – Drinks and snacks available from 7pm at the cinema bar; Screening at 8pm, followed by a Q+A with the director, David Roux. 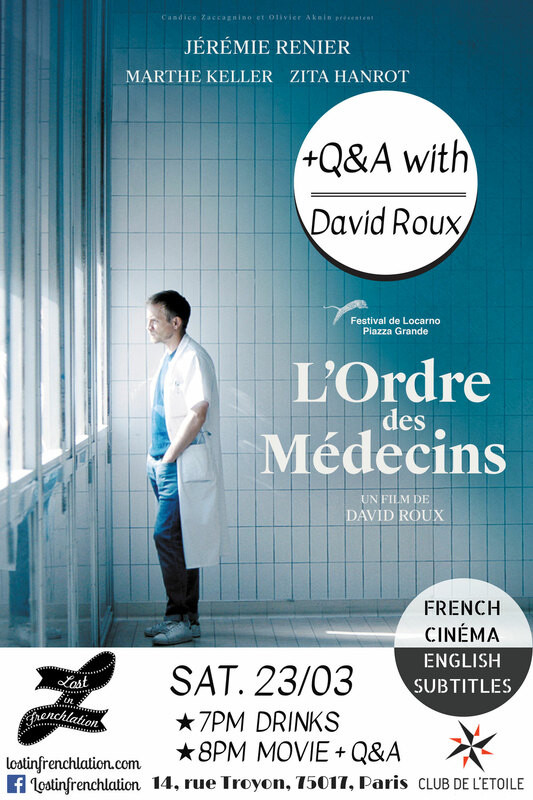 Director David Roux will join us at Club de l’Étoile on March 23rd to watch his first feature film with English subtitles and engage with the audience in a question and answer period afterwards. This unique film shows the protagonist’s struggle with his mother’s cancer diagnosis both from the perspective of son and doctor, and was based on Roux’s own life. The screening will take place at Club de l’Étoile cinema, located a short walk from the world-famous Arc de Triomphe! We will be offering a variety of French-inspired drinks and snacks during our cocktail hour from 7pm and start the screening at 8, followed by a Q&A with the director in English. Make sure not to miss this emotional, thought-provoking film on March 23rd. Its personal aspect makes the story especially intimate and moving to audiences.